The clique you can trust: 17-Year-Old Bride Murdered By Husband For Not Being A Virgin? 17-Year-Old Bride Murdered By Husband For Not Being A Virgin? The husband of a 17-year-old girl is being sought by police in Pakistan after she was found strangled to death the day after her wedding. Khanzadi Lashari married her cousin, Qalandar Bux Khokhar, the night before her body was found in her bedroom when policemen forced their way into the house in the ADC Colony area of Jacobabad. Her husband was said to be missing. Khanzadi's brother, Ali Sher Lashari, lodged a formal complaint with police, accusing Mr Khokhar and his four brothers of killing her. 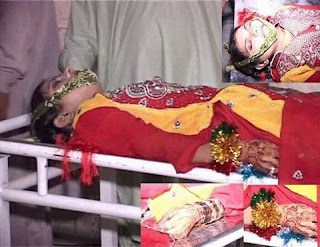 Photographs of the dead teenager were shared on social media and some speculated that she could have been killed by her husband for not being a virgin.